The New Pearl Harbor Revised, Disturbing Questions About the Bush Administration and 9/11, by Dr. David Ray Griffin. Book: ﻿9/11 Contradictions: An Open Letter to Congress and the Press David Ray Griffin. 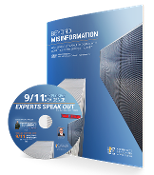 Lists and analyzes 25 contradictions in the government's explanation 9/11. ﻿9/11 and American Empire (Volume 1) Intellectuals Speak Out. Edited by David Ray Griffin and Peter Dale Scott. ﻿29 Structural/Civil Engineers Cite Evidence for Controlled Demolition on 9/11. Over 2500 more architects and engineers have joined them. Thirteen-page article. Structural engineer Ron Brookman probes the NIST analyses of World Trade Center Seven (WTC 7). Article that explains how the actual features of the destruction of WTC 7 contradict the government's explanation, and how the cause can only be explosive controlled demolition. Five-page letter to AIA President Marvin Malecha that was enclosed with information that exposes the fraud of the official explanation with simple, rational forensic inquiry and basic physics.